The busy streets and highways are breeding grounds for automobile accidents. These accidents cause both body damage and glass damage that needs prompt repair. Not all auto glass repairs and replacements are the same and choosing a reliable company is easy when you know the facts. PG Los Angeles auto glass repair provides fast response service to residents involved in accidents, severe weather damage or acts of vandalism. Getting safely back on the road after an accident is the top priority. Most drivers believe that certain repair companies or auto dealerships have to be used due to loans and lease agreements. Every driver has the legal right to choose a company that provides fast service for an affordable price. The quality of glass is important and most dealerships and body shops rely on aftermarket glass that is not recommended by your automaker. PG Los Angeles auto glass repair uses only OE replacement glass for windshields, side doors and rear windows on your motor vehicle. Cracks, splits and fractures that appear in auto glass need to be repaired before a replacement is required. The changing temperatures affect the deterioration to window glass and the structure is weakened. This reduces visibility for driving and safety during a collision. PG Los Angeles car window replacement technicians respond 24/7 to provide high quality service to drivers that need mobile auto glass repair services. Staying put after damage occurs to your auto glass is important to your safety. PG Auto Glass service trucks come to you. Residents, business owners and city officials depend on reliable transportation each day. Functional automobile glass plays a large part of safety and security. Glass damage can happen on the highway, city streets, parking garages or parking lots. The majority of drivers experience problems after business hours have ended. PG Los Angeles auto glass replacement technicians are the most trusted source for emergency service when auto glass damage is reported. These professionals work hard to accurately restore or replace broken, chipped or cracked auto glass. 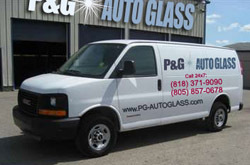 PG Auto Glass is the trusted source for repairs and replacements. Our highly experienced and trained technicians for auto glass repair in Los Angeles are able to help you and repair any damages to your auto glass. If the damage is severe, the necessary glass and other equipment are carried on our service vans for auto glass replacement in Los Angeles and your glass will be replaced with a quality and brand new one in no time. Residents of Los Angeles in zip codes 90010, 90011, 90012, 90013, 90014, 90015, 90016, 90017, 90018, 90019, 90020, 90021, 90022, 90023, 90024, 90025, 90026, 90027, 90028, 90029, 90030, 90031, 90032, 90033, 90034, 90035, 90036, 90037, 90038, 90039, 90040, 90041, 90042, 90043, 90044, 90045, 90046, 90047, 90048 and 90049 can trust PG Auto Glass for their auto glass repairs and replacements.